The truth is exactly the opposite. A progressive city is measured by its policies and laws. And San Francisco’s policies and laws are more progressive than ever. From the universal support for Prop J’s raising the minimum wage to the nation’s highest to enacting the city’s first affordable housing trust fund to increasing its commitment to pedestrian safety and bike lanes, San Francisco’s national leadership on progressive issues remains strong. In order to reach a conclusion that we are seeing a progressive decline, it requires a belief in an imaginary, more progressive past. Knight sees the year 2000 as marking the height of progressives’ power and influence. She notes that in 1999 progressive Tom Ammiano “came within striking distance of upsetting Mayor Willie Brown” and that the 2000 elections ushered in a new progressive Board of Supervisors. But Ammiano came nowhere near defeating Brown. He lost 58% to 39%. That’s far from “striking distance.” In fact, the magnitude of his defeat led some to declare his loss a huge setback for progressives. It was actually a springboard to future progressive success. Knight says progressives have not held the mayor’s seat “since Art Agnos left office in 1992.” That would mean progressives’ were in decline two decades ago. And by this standard, progressives’ golden era may go back even further, if it exists at all. The Bay Guardian was as critical of Mayor Agnos as it was of Mayor Lee; two progressive supervisors ran against Agnos in 1991 and Bay Guardian stalwart Sue Hestor did not endorse Agnos for re-election. In the real San Francisco, 1992 was a high point for progressive politics. Tenants won their first ballot measure, as Prop H cut annual rent increases in more than half. Its victory set in motion a series of tenant victories at the ballot for the next two decades. In 1992 progressive Sue Bierman won a citywide election for supervisor. She joined a progressive Board of Supervisors featuring Carole Migden and Kevin Shelley, both of whom soon left for the State Assembly. It should be obvious even from this brief history that San Francisco’s “progressivism” can’t be measured by the election or defeat of certain candidates. The city has regularly moved in a progressive direction regardless who was on the Board or in the mayor’s office. For example, the two most significant tenant victories in San Francisco history—Prop H in 1992 and Prop I in 1994 (which brought owner-occupied buildings of four units or less under rent controlled) occurred under pro-landlord mayor Frank Jordan. Those arguing that Jordan’s election meant the city shifted to the right had a hard time explaining the many landmark progressive policy gains during Jordan’s mayoralty. I have no idea what “tighter controls on real estate development” Knight is talking about, since voters rejected development restrictions (Prop L) on the same 2000 ballot which elected a progressive Board. But paid sick leave and the minimum wage hike were passed by voters, not enacted by the Board. In fact, Matt Gonzalez urged activists to go to the ballot for the minimum wage hike because he didn’t trust the Board to pass a progressive increase. The Board never pushed paid sick leave, which was a ballot measure conceived and led by the nonprofit group, Young Workers United. The 2000-2010 Board did enact legislation known as the McGoldrick TIC measure, but most tenant protections during these years were won at the ballot. And the Board enacted no tenant protection measures after Mayor Newsom took office in 2004. So again we have a mis-remembered, even fictional past of the Board progressive accomplishments that in fact is a testament to the San Francisco electorate’s support for progressive policies. San Francisco’s progressive electorate still exists today. I wrote an article last December 13, “Looking for San Francisco’s Bill de Blasio? His Name is Ed Lee.” My point was that Lee’s policies were more progressive than New York City’s vaunted “progressive” mayor. Since that time de Blasio has deferred to the real estate industry on inclusionary housing, been engulfed in ongoing police misconduct against racial minorities, and primarily made change around the edges. But whereas de Blasio remains identified as “progressive,” Lee is not. Some on San Francisco’s left have never accepted Lee because they don’t like some of his supporters and he is not “their” guy. It doesn’t matter that Lee’s housing program is far more progressive than de Blasio’s; these folks apply a criteria for “progressive” that nobody who reached the mayor’s office could meet ( Matt Gonzalez used to joke during his 2003 campaign that if he won he too would soon be attacked from the left). If Knight’s front-page Chronicle story is accurate, Lee has stifled progressive reforms and moved the city to the right. He’s done exactly the opposite. The chief policy criticism of Lee from some progressives is that he has not “done enough” to address the impacts of tech. But what legislation or ballot measure has the mayor opposed that would more effectively address these impacts? Mayor Brown in his second term and Mayor Newsom did use their power to prevent progressive measures. Mayor Lee has not. Knight’s assessment of San Francisco’s progressive movement relies almost exclusively on white male “experts.” The only exception is activist Van Jones, who has not worked in the city for years and is unconnected from its politics (Van is the stellar progressive voice on CNN’s Crossfire). Did Knight really have to turn to a national political commentator to find a person of color to comment on local San Francisco politics? She could have asked D6’s progressive supervisor Jane Kim. Or D1’s progressive supervisor Eric Mar, who has been active in progressive movements in San Francisco for decades. 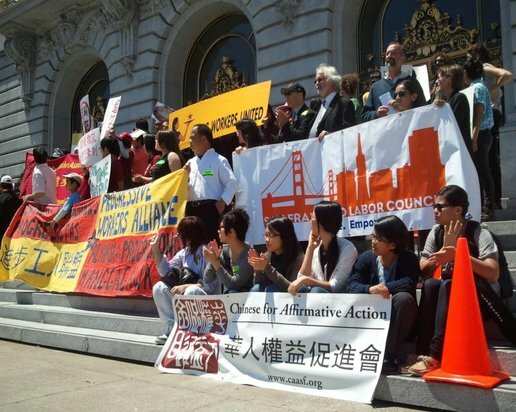 Knight could have found other Asian-American voices in a city whose voters are roughly 33% Asian-American, and whose largest and most politically active tenant organization is the Community Tenants Association of Chinatown. She also could have elicited the views of the Asian-American progressive activists behind the push to end wage theft, for which San Francisco has been a national leader. This campaign emerged from the Chinese Progressive Association, whose ongoing success represents another progressive step forward that Knight’s account ignores. Yet the Chronicle continues to act as if the city’s overwhelmingly white demographics of the 1950’s are unchanged. The progressive movement is not primarily white, and it has not been so for some time. That’s complete bull. The event was scheduled to grieve for Ted’s loss, not for the Bay Guardian’s closure.